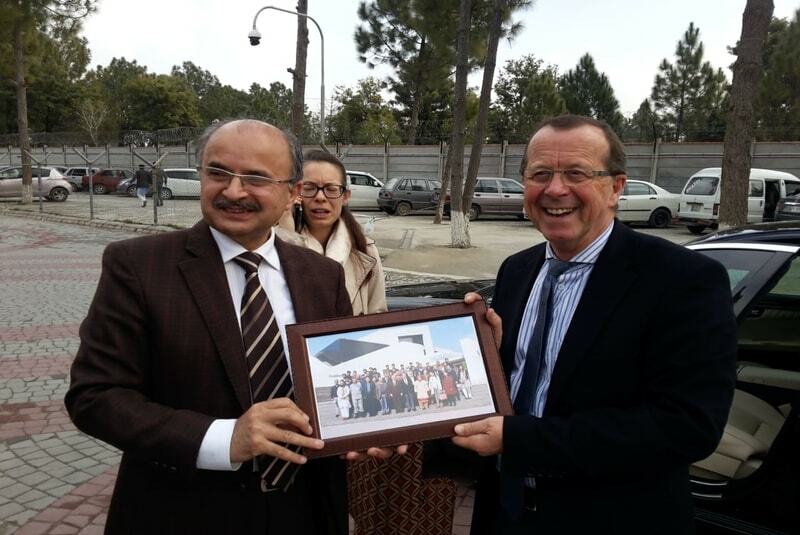 ISLAMABAD (Jan 29, 2019): Ambassador of Germany to Pakistan HE Martin Kobler has said that he is deeply impressed with and is in love with Pakistan due to the warm hospitality he always received from the Pakistani people and the heritage-rich beautiful landscape of the country. He made these remarks during his visit to Air University, Islamabad. On the occasion, the German envoy was warmly welcomed by the Vice Chancellor, Deans, Directors, HoDs, faculty members and a large number of students. The ambassador, during his visit, admired the state-of-the-art building and an overall aura of modernity by labeling it as a “modern”, “friendly” and “green” University which is right way headed into the future. Advising the students intending to apply for Masters and PhD admissions in German Universities and subsequently for a German visa, he said that they should apply for admissions and then for visa as early as possible. He also advised that after booking a visa appointment students must show up for visa interview and make sure that they brought with them all required documents. "Otherwise, a new visa appointment may take as long as six weeks," Kobler said. 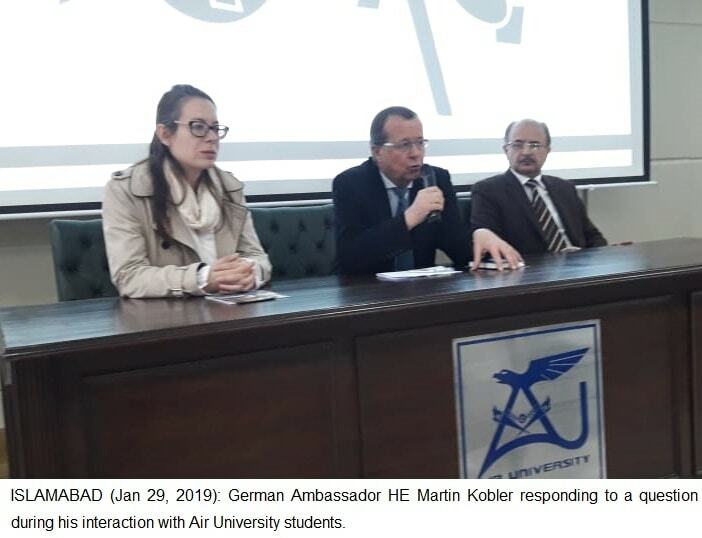 ISLAMABAD (Jan 29, 2019): German Ambassador HE Martin Kobler responding to a question during his interaction with Air University students. 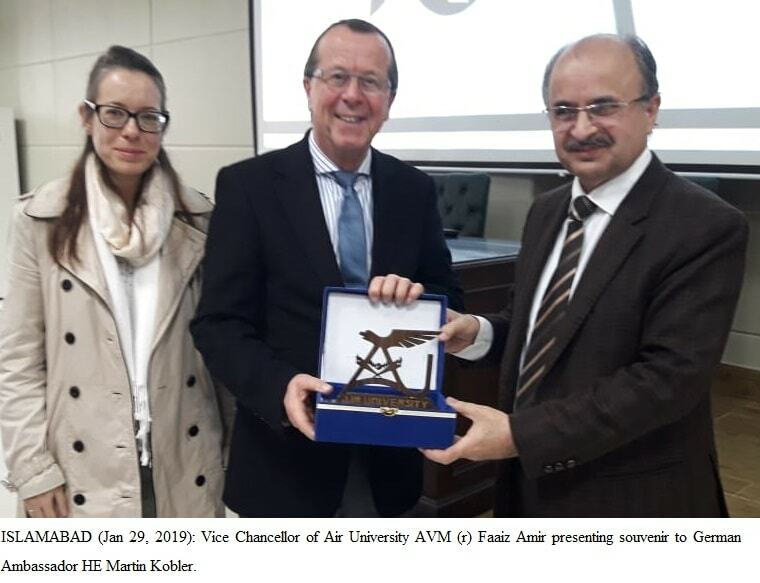 ISLAMABAD (Jan 29, 2019): Vice Chancellor of Air University AVM (r) Faaiz Amir presenting souvenir to German Ambassador HE Martin Kobler. 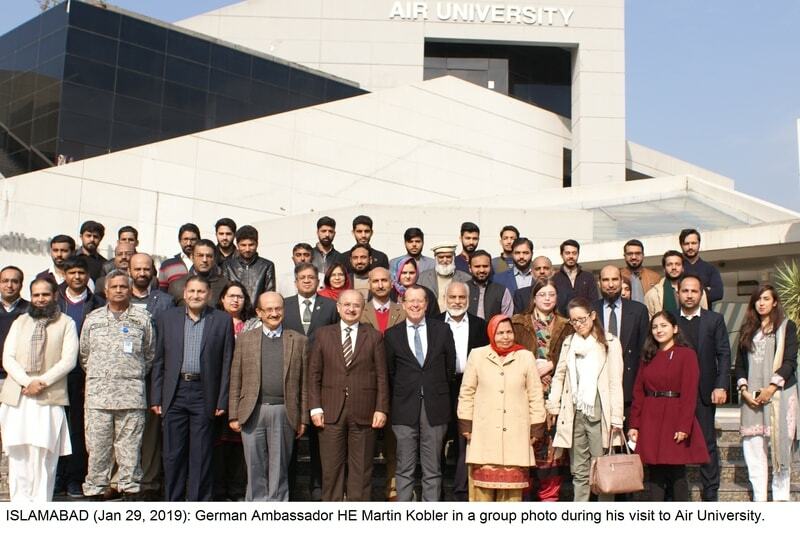 ISLAMABAD (Jan 29, 2019): German Ambassador HE Martin Kobler in a group photo during his visit to Air University.